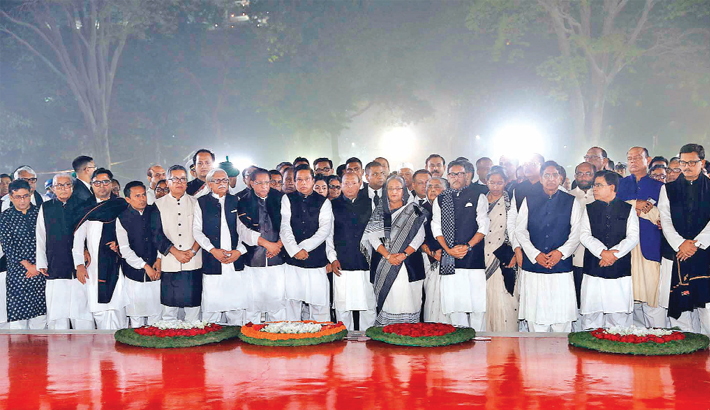 People from all strata of life and representatives from different socio-political, educational and cultural institutions and organisations pay rich tributes to the martyrs of the 1952 historic Language Movement by placing wreaths at the Central Shaheed Minar in the capital on Thursday. (2) Speaker Dr Shirin Sharmin Chaudhury. (3) Chief Justice Syed Mahmud Hossain. 8) A replica of Shaheed Minar. (9) DU Vice Chancellor Prof Md Akhtaruzzaman.